How do you protect plants from wind damage and similar challenges in the yard during winter? Using tree wrap or shelters are two possible options, both of which are explored below. You will also learn what steps to take to winterize your perennial beds; mulch can come to their rescue as long as you know how to use it properly (see below). High winds are not your only enemy in winter. Most deciduous flowering shrubs, unlike their evergreen counterparts, provide little visual interest in winter, yet these shrubs can be damaged by heavy snows or ice storms that snap their branches. To avoid such plant damage, you can build or buy a shelter within which to house your flowering shrubs for the winter. Since most of them provide little visual interest in winter anyway, you have little to lose by tucking them out of sight under a shelter. You can build shrub shelters out of natural materials. You can build an A-frame (or "snow frame") out of store-bought lumber. You can buy a snow frame (available at some hardware stores, etc.). Shelters come not only in various sizes, but also in various shapes and materials. But for all such shelters, you are essentially building a framework that will support a "roof." The roof will keep excessive snow and ice off your shrubs. In this tutorial on winter protection with shrub shelters, for example, you can find out how to build a rectangular protective structure with rustic poles, to be covered with pine boughs for roofing. This type of housing for your shrubs is made completely from natural materials that can be gathered for free if you live in the country. Shelters may also assume an "A" shape or a tepee shape, however, both of which shed snow and ice well. Furthermore, as an alternative to rustic poles, the building material may be lumber or metal. But besides the fact that you have to buy such materials, another potential drawback is that some people do not like the look of them. In addition, it would be difficult to fit most A-frames over large shrubs. Unlike most deciduous shrubs, evergreen shrubs are the cornerstone of visual interest in the winter landscape, and admiring their beauty can lift your spirits while you are snow shoveling. Therefore, offering them winter protection similar to that suggested for deciduous shrubs is a hard sell, since the shelters mentioned obscure the plants. Evergreen shrubs can, however, suffer injury during winter due to the harsh conditions, especially wind damage. For this reason, some people do protect their prized evergreen shrubs in winter, even though it ruins the visual display. To protect evergreen shrubs from snow and ice, you can purchase commercial tree wraps. The tree wraps with which you are perhaps most familiar are made of burlap netting, available at local hardware stores. Do not confuse this product with the "tree wraps" used to prevent sun scald on trunks. How do you use tree wrap? One method is to bind up a shrub, mummy-style. By wrapping plants with tree wrap in this manner, their limbs are pulled in toward their trunks and supported, so that they will not snap under the strain of snow or ice loads. But there is another way to use tree wrap. A bigger challenge than snow and ice for evergreen shrubs is presented by the drying winds of winter. Dwarf Alberta spruce trees and any newly planted evergreens are highly susceptible to such wind damage, so they should be protected. While the "mummy-style" method mentioned above can also be used to protect plants from wind damage, you have another option, as well. You can minimize wind damage to evergreen shrubs by building a shelter around them to fend off the winds. Being a windbreak, this shelter differs from the type mentioned above for deciduous shrubs: the emphasis is on the sides, not the "roof," because its purpose is to keep wind out, not snow and ice. If you do not receive a lot of snow and ice where you live and find this method easier, by all means use it. The project begins by building a wire cage around the shrub. To build the wire cage, first install four poles (2x4 lumber is fine) into the ground around the shrub, forming a rectangle. Then attach chicken wire to the poles (by hammering in fence staples), stretching it from pole to pole. When you are done building this structure, fasten burlap to its sides by stapling it on to the poles. Note that the chicken wire is actually optional, but it does provide extra stability, so that your burlap will not be flapping around in the wind, which could damage it over time. The chicken wire can also aid in pest control (see below). The burlap will reduce the shrub's exposure to drying winds. Protecting evergreens from the wind in this way can minimize the moisture loss their leaves or needles suffer and help save them from what is termed "winter burn." An "anti-dessicant" (anti-drying agent) can also be sprayed on certain plants to reduce their susceptibility to drying wind damage. For instance, you can use an anti-dessicant on a boxwood hedge. Apply it in late fall, but before freezing temperatures settle in for good. If you wish to keep your evergreen shrubs "on display" during the winter, there is still some winter protection from high winds that you can afford them. But this winter protection is provided in advance, in the form of a proper watering regimen during the fall. This regimen applies as much to trees as it does to shrubs, and as much to deciduous specimens as to evergreens. Try watering plants sparingly throughout early autumn, until the time when the leaves of the deciduous trees fall. In late autumn, after the deciduous trees have dropped their leaves, give both evergreen and deciduous trees and shrubs a deep watering. Watering plants sparingly in early autumn will allow them to transition more smoothly from the growing season into the dormant season. Plants treated in this way will be less likely to put out new growth. At first glance, that may sound like a bad thing, but it is not. In fact, you do not want to see new growth at this point, because it will be tender and could well be damaged when winter arrives. The dropping of the leaves on deciduous trees later in autumn is a convenient signal, a visual cue that it is time for watering plants to prepare them for winter. Trees and shrubs should be watered deeply at this time. Make sure to do so before the ground freezes, so water can reach the roots. Watering plants properly in fall is not the only "preventive medicine" to administer to trees and shrubs. Proper pruning can also go a long way toward winterizing them. And part of proper pruning is knowing when -- and when not -- to prune. Do not prune trees or evergreen shrubs in the early part of fall. Pruning at this time would encourage tender growth, which you do not want. If you need to prune trees or evergreen shrubs, wait till late winter or early spring, generally. But in late fall you can look to remove weak branches that might otherwise snap in winter. Early-blooming deciduous shrubs are often pruned after they have finished flowering. Later bloomers are often pruned in early spring. While pruning them, again, look to remove weak branches that might otherwise snap during the next winter season. Do you have tall trees near your house? If any of their branches are hanging over the house (thereby posing a safety hazard), have a professional come over to "limb" the trees. This is for the house's sake, not the trees'. The burlap shelter mentioned earlier can serve to protect shrubs (and small trees) not only from wind, but also road-salt spray. In addition, the chicken wire (if buried a few inches below-ground) can serve to keep pests from nibbling at your plants. Avoid piling up mulch right around the base of a tree or shrub, as the mulch provides a hiding place for rodent pests, which might gnaw at the trunk. Keep the mulch at least a foot away from the base. In perennial flower beds, the answer for winter protection can lie in any of the organic landscaping mulches. Cedar mulch is a favorite, but there are other options (pine bark, wood chips, pinestraw, hay, straw, etc.). These organic landscaping materials provide a layer of insulation over perennial flower beds that helps protect your borderline-hardy plants from cold. 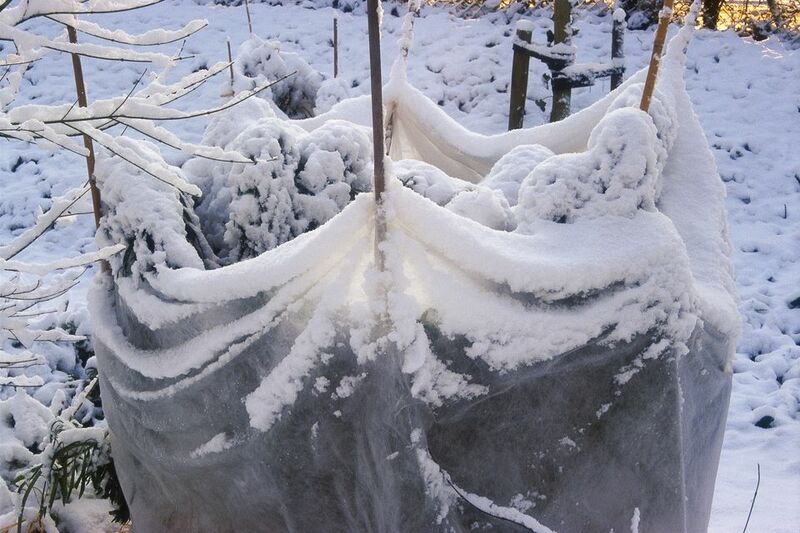 Snow cover also helps insulate perennial flower beds, but Mother Nature is unreliable. And while plastic-sheet mulch and landscape fabrics will keep weeds down, they do not offer much insulation value. Although organic landscaping materials eventually decompose and have to be replaced, their decomposition also has a positive aspect: Nutrients are released, functioning as soil amendments. Since it doesn't break down as readily as some materials, it is not as effective at returning nutrients to the soil. Some of the insects it discourages may be beneficial. As you can see from this consideration of its pros and cons, our estimation of cedar bark mulch's value depends largely on our personal preferences. Cedar mulch is long-lasting, so it is favored by those who do not want to be bothered with frequent replacement. But this quality is a double-edged sword, since that very longevity means cedar mulch will not replenish the soil with nutrients as quickly as will many other organic landscaping materials. One could also be ambivalent toward cedar mulch's insect-repelling quality: Some insects, remember, are beneficial. When to apply: Apply cedar mulch after there has been 2-3 days of sustained freezing temperatures. How much: Apply 4-5 inches of cedar mulch for winter protection. When to remove: In early spring, begin gradually pulling back cedar mulch away from your perennials, so as not to suffocate them. Note that premature application in fall gives rodents a better chance of making a home under your cedar mulch -- something you clearly do not want. Thus the recommendation to wait for the arrival of freezing temperatures in your area. Note also that cedar mulch used for winter protection is treated differently than if you were using it in summer for weed control. For the latter use, apply 2 to 2.5 inches. But for winter protection, double that thickness (you want the extra insulation). Remove diseased stems and foliage on perennials. But, in general, you can leave healthy stems and foliage on perennials. Dig up non-hardy bulbs for storage. For most perennials, leaving the stems and foliage intact over winter -- assuming they are healthy -- is fine. In fact, doing so can add a little insulation value. In some cases, there is even an aesthetic reason to follow this practice: Ornamental grasses, for instance, are often at their showiest in winter. But perennials plagued with disease or insects should be cut back in fall to reduce the chances of infestation the following season. For example, bee balm and garden phlox have a tendency to be covered with powdery mildew by fall, in which case it is best just to cut them down to ground level. Non-hardy bulbs, such as cannas, elephant ears and dahlias, should be dug up. Spread out the bulbs to dry in the sun for a few hours before storing them in a cool, dry place inside (garage, attic) for the winter.